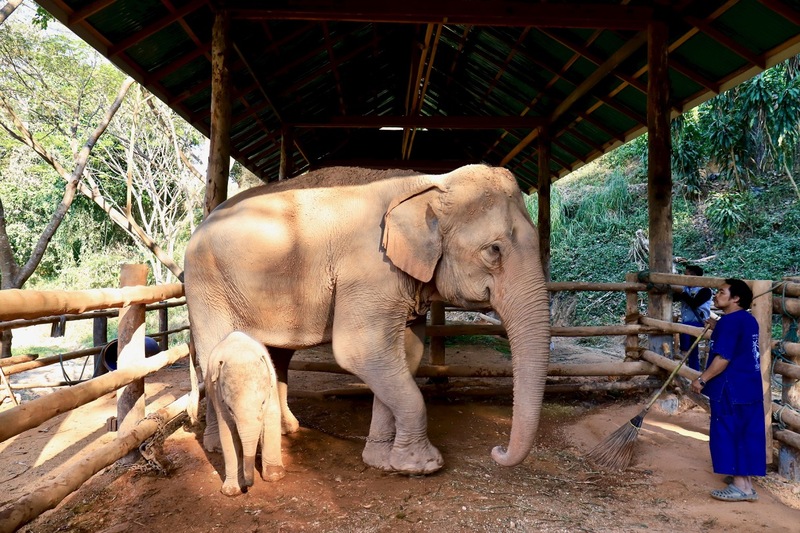 A visit to Maesa Elephant Camp in Chiang Mai, Thailand. This article would be the last instalment of our travel program to Chiang Mai, Thailand, with Team Epiphany Go Chiang Mai during 29th January 2018 to 3rd February 2018. 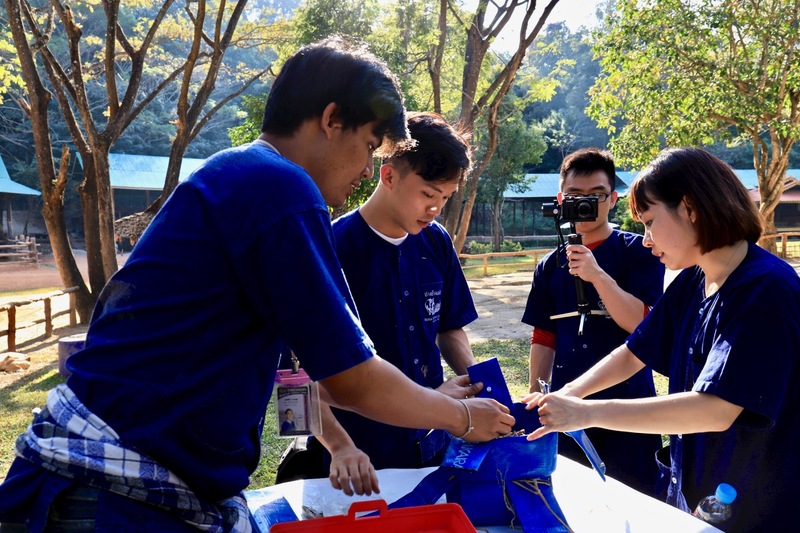 We spent some time visiting and understanding three different sectors of Maesa Elephant Camp, namely, Thai Elephant Kingdom at Maesa Elephant Camp, Maesa Elephant Nursery and The Thai Elephant Care Center (Maesa Elder Camp). Elephants play an important role in Thai society, culture and history. The elephant is the official national animal of Thailand, therefore their presence can be seen in many parts of Thailand. 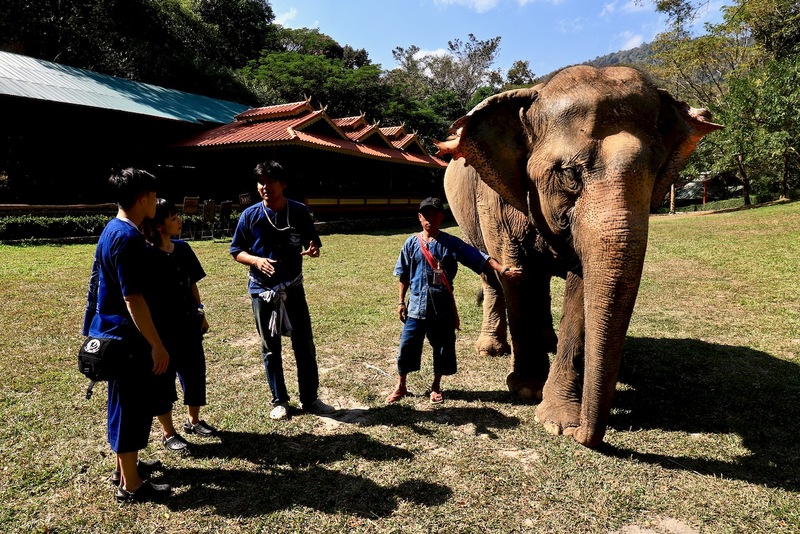 Historically, elephants played different roles in Thai society, from fighting wars, to providing manual heavy labour, transportation to the tourism industry today. 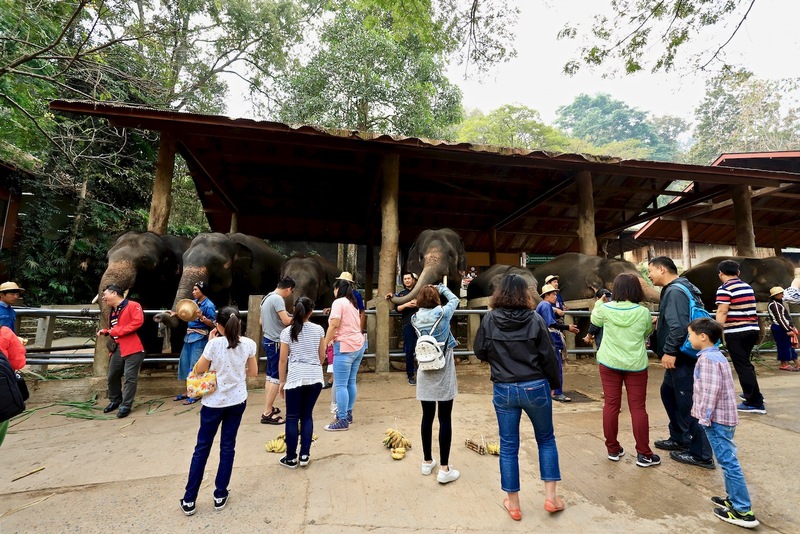 Maesa Elephant Camp is a tourist destination in Chiang Mai, Thailand, establisehd on 8thApril 1976 by Mr Choochart Kalmapijit. Over the decades, they have transformed, not just on the elephant show performance, they have also evolved into a well organised system and network to take care of the elephants when they are young as well as when the elephants are retired, along with a healthy supply of food and medical care for the elephants under their charge. There are theree destinations to visit within Maesa Elephant Camp, let me bring you through the activities that you can participate, learn and interact with the elephants and the people taking care of them, from my short stories and photographs. For the visits to Maesa Elephant Nursery and Maesa Elder Camp, visitors can change into their Maesa Elephant Camp attire and you do not need to worry about getting your clothes sweaty, dirty or wet from interacting with the elephants or when having your hands on activities to learn more about elephant care, nutrition and food preparation. 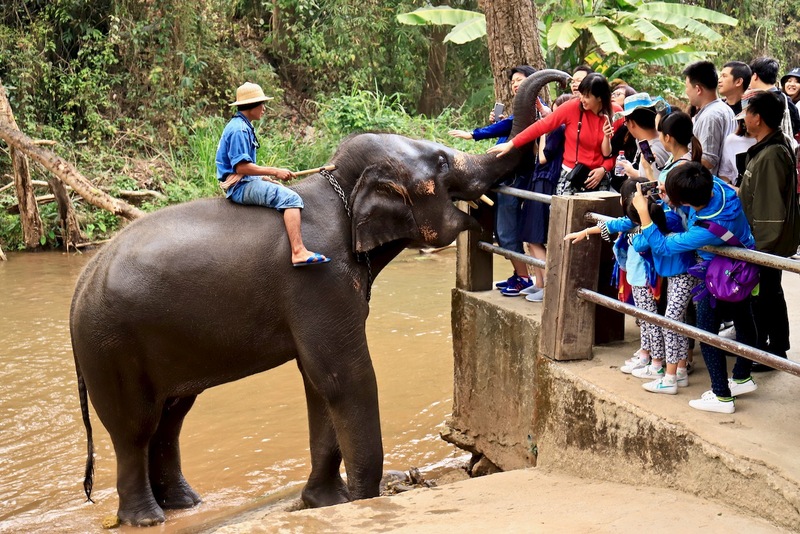 The star attraction of Maesa Elephant Camp, a well known tourist destination in Thailand, popular with tourists when you look at the number of visitors there. Visitors can buy fruits and get up close to the elephants in their enclosure, feeding them, playing with them, getting their photos taken by their family, relatives or friends. Prior to the main performance show by the elephants, the elephants would head down to the river stream for a bath and shower, watched by the enthusiastic crowds of visitors from the sides. 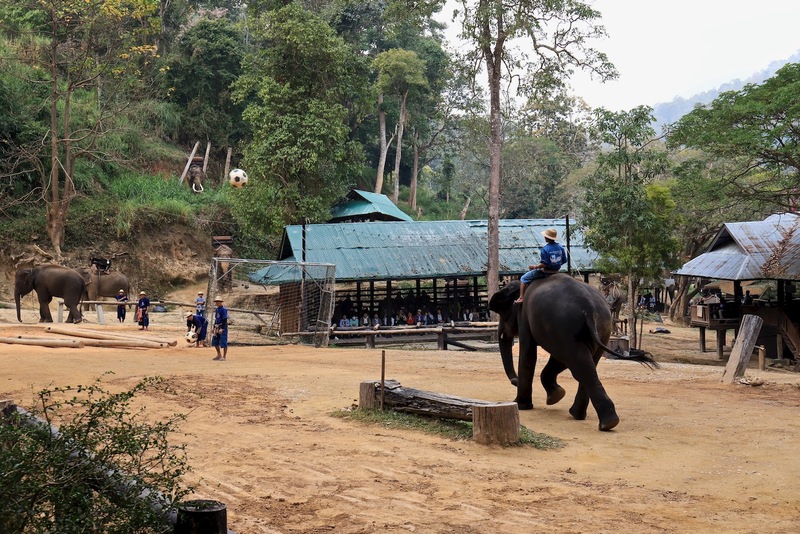 At the main performance ground inside Maesa Elephant Camp, visitors were sitted around the arena, watching the elephants perform, from playing football, drawing paintings, how they do logging during the era when logging was permitted in Thailand. The elephants are smart and friendly, popular with the visitors there. After the performance ended, the elephants would go to the sides and interact with the visitors, posing for photographs and getting more of their favourite fruits. The Maesa Elephant Nursery is similar to the Masea Elder Camp, except that it’s for the young and baby elephants. Visitors are able to feed and watch the young elephants at the nursery. When you visit the mummy elephant with her baby elephant, do be careful as the mummy elephant might be more protective of her baby, just like a parent being protective of their child. Tiffany, Peps, Valentino and myself prepared some food and nutrition for the baby elepant into a toy for one of the baby elephants to play with. 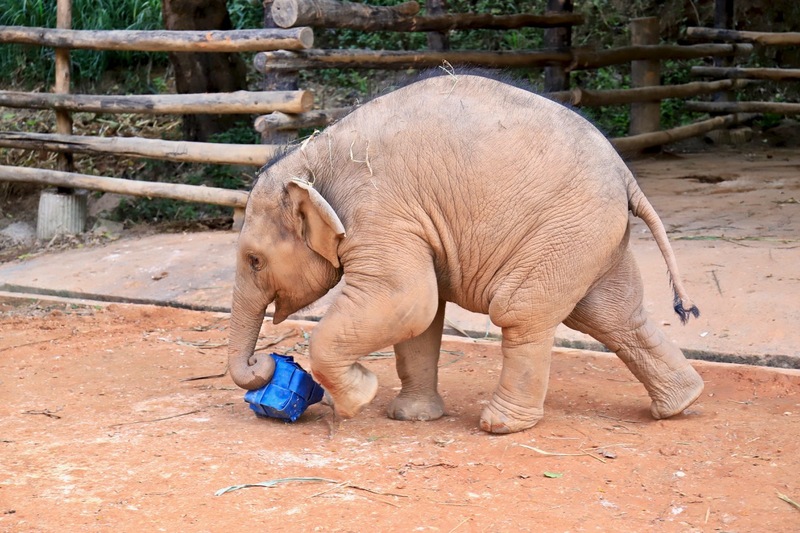 The baby elephant was really cute and adorable, very enthusiastic, played with the toy that we made! Just like the other two destinations at Maesa Elephant Camp, the elephants love their fruits, you can feed them and interact with the elephants! Visitors can also bath and shower the young elephant at the river stream, a fun and interactive activity for visitors and for the elephant! 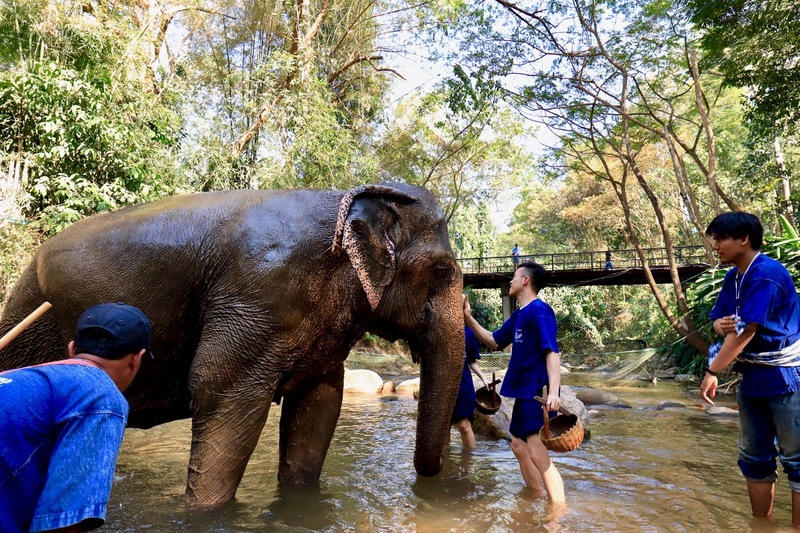 I reckon the elephants love getting a swim, bath and shower in the river stream, while being taken care of by visitors and the elephant care person. 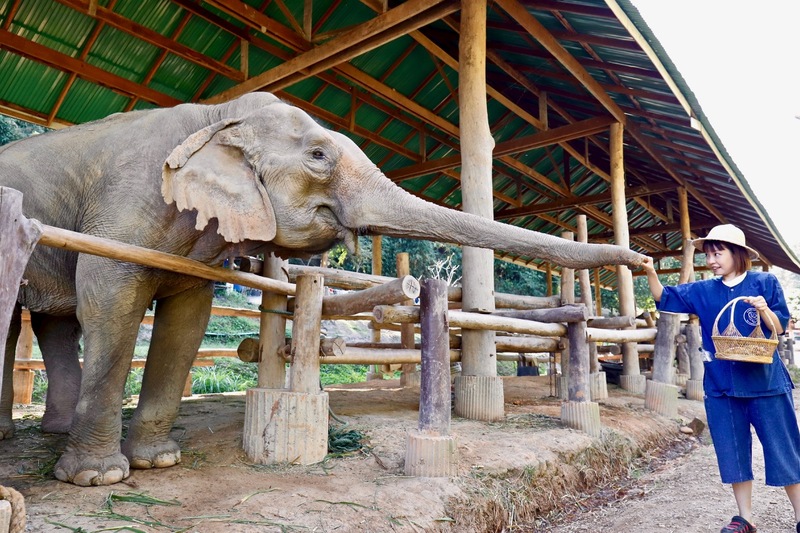 For the elephants that are older in age, they would still be taken care of when they retire, at the Thai Elephant Care Center (Maesa Elder Camp). The retiree elephants health and nutrition are taken care of carefully by the staff of Maesa Elephant Camp. For visitors to the Maesa Elder Camp, they have tours for them to join. 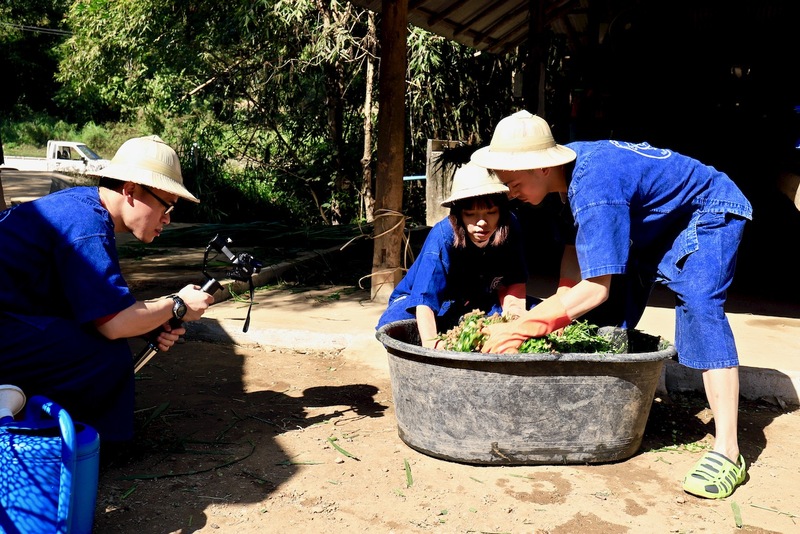 They are able to have a hands on experience in preparing food for the elephants, bringing it to some of the elephants, feeding them and patting them. 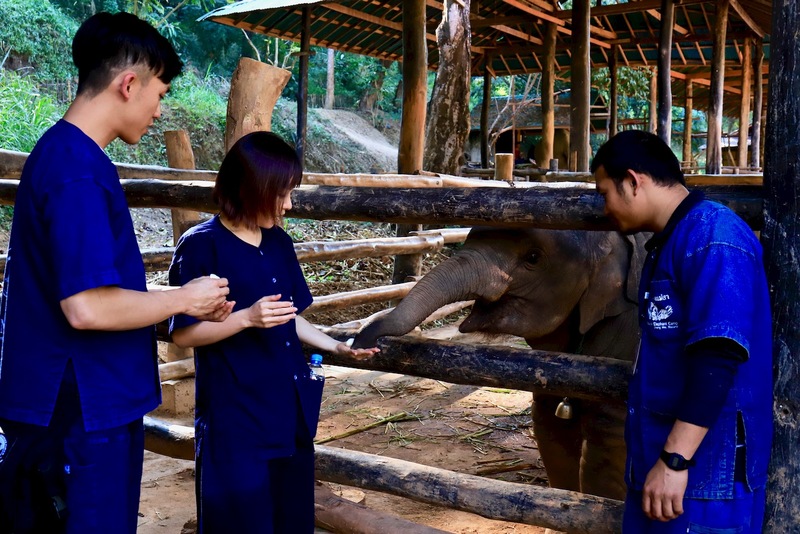 One of the hands on experience that visitors can have is preparing health supplements for the retired older elephants, guided by the elephant doctors. Besides having good and nutritious diet, the elderly elephants also go for walking exercises with their care person too, you can spot them walking around the Maesa Elder Camp! 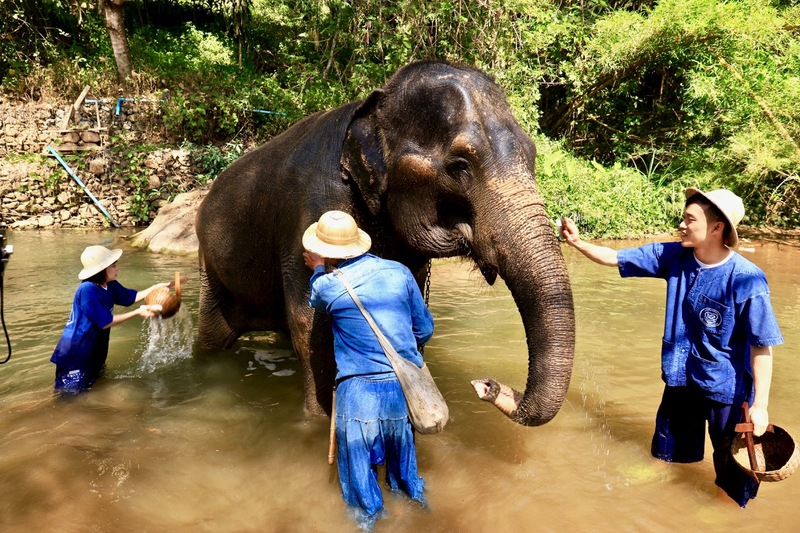 Visitors can also have the experience of showering/bathing the elephant in the river, the elephant likes having a bath time in the river, getting scrubbed clean. It’s a fun and enjoyable experience for visitors too, getting into the cold river stream with the elephant. Overall, the retiree elephants are friendly and nice, even though they are big in size. They can be pretty enthusiastic when it comes to food, just like us human beings! Maesa Elephant Camp, to visit or not? First and foremost, elephant shows in Thailand, have its fair share of bad press and ill treatments of the elephants, the stories and photos can be found on the internet and social media. 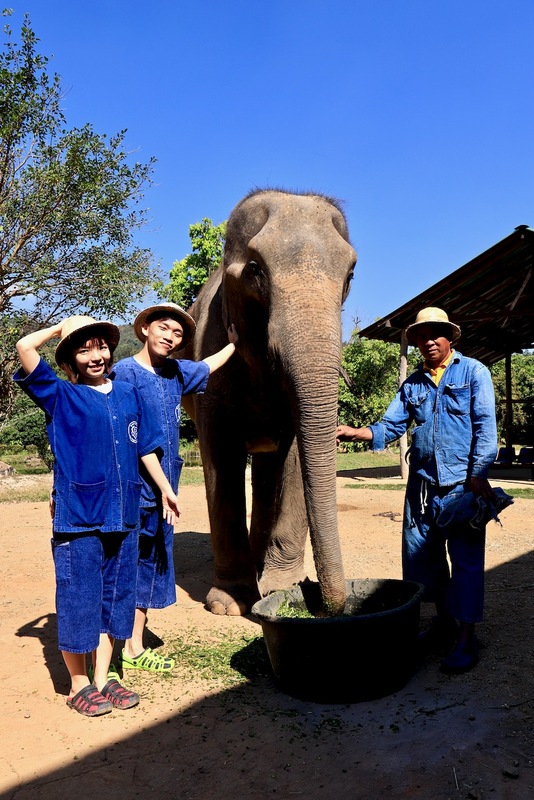 During my visit to Maesa Elephant Camp, visiting their three different destinations, Thai Elephant Kingdom at Maesa Elephant Camp, Maesa Elephant Nursery and The Thai Elephant Care Center (Maesa Elder Camp), I observed that they do take good care of their elephants, from young to old. 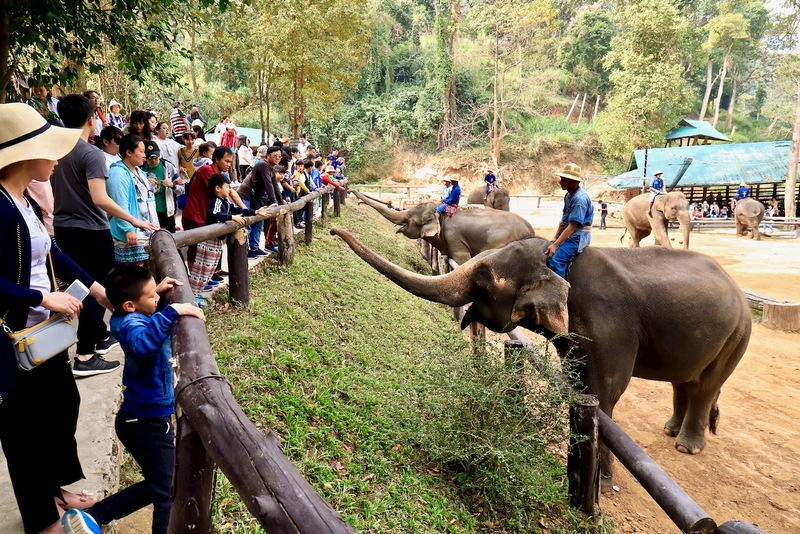 My personal recommendation for visitors, if you are planning to visit Maesa Elephant Camp, is to visit all three destinations, Thai Elephant Kingdom at Maesa Elephant Camp, Maesa Elephant Nursery and The Thai Elephant Care Center (Maesa Elder Camp). This would allow the you, to have a holistic and better understanding of Maesa Elephant Camp, their activities, meals, nutrition and health care for young, adult and elderly elephants, and not just the main tourist attraction at the Elephant Kingdom at Maesa Elephant Camp. Photographs that I took during our visit to Maesa Elephant Camp can be viewed here inside this flickr photo album! Do check out my Chiang Mai travel adventure photographs of the various destinations that we visited during our Chiang Mai travel adventures!